In an increasingly demanding world of literacy, it has become critical that students know how to write effectively. From the requirements of standardized tests to those of the wired workplace, the ability to write well, once a luxury, has become a necessity. Many students are leaving school without the necessary writing practice and skills needed to compete in a complex and fast-moving Information Age. Unless we teach them how to run with it, they are in danger of being run over by a stampedea literacy stampede. 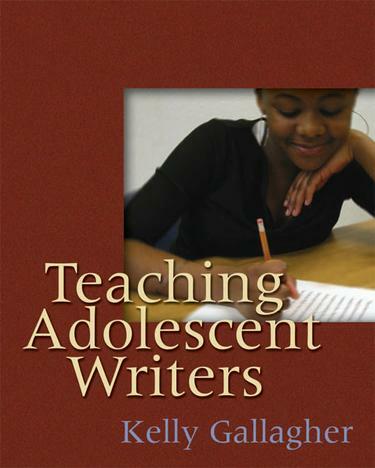 In Teaching Adolescent Writers, Kelly Gallagher, author of Reading Reasons and Deeper Reading, shows how students can be taught to write effectively. Kelly shares a number of classroom-tested strategies that enable teachers to:understand the importance of teaching writing;motivate young writers;see the importance modeling plays in building young writers (modeling from both the teacher and from real-world text);understand how providing choice elevates adolescent writing (and how to allow for choice within a rigorous curriculum);help students recognize the importance of purpose and audience;assess essays in ways that drive better writing performance. Infused with humor and illuminating anecdotes, Kelly draws on his classroom experiences and work as co-director of a regional writing project to offer teachers both practical ways to incorporate writing instruction into their day and compelling reasons to do so.